Anyway, let’s get onto the film. AFTER: Clint Eastwood delivers yet again with Mystic River creating suspense and mystery without relying on large chase scenes and showdowns. What stuck out to me the most was the style of the story. 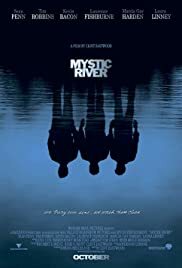 The film is based on the novel Mystic River by Dennis Lehane who also wrote the novel for Ben Affleck’s Gone Baby Gone so Lehane is no stranger to the marathon. Right away I noticed many similarities to Lehane’s other mysteries, and that’s a good thing. One of the reasons Mystic River is such a great mystery is because the story is well crafted. All good mysteries usually are tough to figure out and when all is revealed at the end you question why you couldn’t see that earlier. But there’s something special about Lehane’s mysteries that make them so interesting: there’s doubt in who the suspect is throughout the movie. You’re positive it’s one person in beginning, then you’re sure it’s another, then you think it’s the first person again, and the actual killer ends up being somebody else. This isn’t unique to Mystic River but this waffling (mmm, waffles) is some of the best I’ve seen. But there’s more to the film than just the story. Eastwood does a phenomenal job at building suspense in two ways: the sound and the acting. In terms of sound, Eastwood does a fantastic job by knowing when not to use any. Many scenes in the film, especially the pivotal scenes, are almost dead silent save for the dialogue. The result is a much more stressful and anxious feeling that if there were lots of sound effects coupled with loud music forcing the emotions of the scene down on the viewer. In terms of acting, the Oscars were spot on. Dave Boyle (Tim Robbins) and Jimmy Markum (Sean Penn) are two brilliantly played characters. Boyle especially was such a complex and conflicted character. Not just conflicting with his surroundings, but major internal conflicts as well. Things did fall a bit short with the women characters. All of them seemed to be tacked on as an afterthought and none were anywhere near the complexity of the men. The whole Devine subplot (with Kevin Bacon and Tori Davis) in particular seemed superfluous and unnecessary. Dave’s wife Celeste Boyle (Marcia Gay Harden) and Jimmy’s wife Annabeth Markum (Laura Linney) were marginally better but still felt dull and unimportant. Mystic River is deserving of it’s Academy Award nominations and wins. First and foremost the film is a great mystery, one that is sure to entertain you and keep you guessing and wondering throughout. However, the clear lack of strong females and other minor issues (the ending is another let down) are holding this film back. Fans of Lehane’s novels and Eastwood’s directing should definitely add this to their lists of films to watch.